76 Days.Our best-tasting white corn, Glacial far surpasses older varieties in taste and texture. 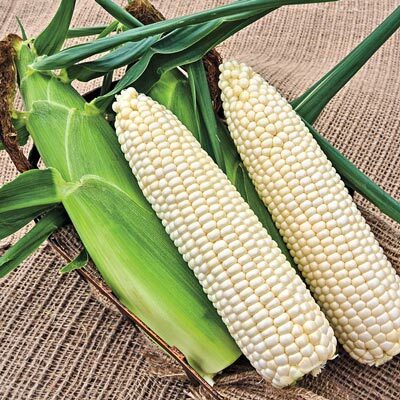 Its plump, 8-8-1/2" ears are packed with glossy white, super-sweet kernels with outstanding eating quality. Dark green husks provide excellent tip coverage. Germination 4 - 7 days at soil temp of 65 degrees F.
For each offer ordered, get Approx. 250 seeds..
Spacing: 10 - 12 inches between plants. 36 inches b etween rows. Plant in blocks of at least 4 rows for adequate pollination. Spread: 1 - 1/2 feet. Soil Requirements: Needs deep, well-drained, fertile soil, pH 6.0 to 6.8 and consistent moisture. Pruning: Pruning - Not necessary to remove suckers (side sprouts growing from the base of the plant). Fruit: Supersweet (sh2) white kernel. 8-8 1/2 inch ears with 16-18 rows. Pollinator: To avoid cross pollination, separate blocks of individual varieties by at least 500 feet, or plant so they tassel at different times. Plants are in pollination mode for 2-3 weeks from time of tassel.